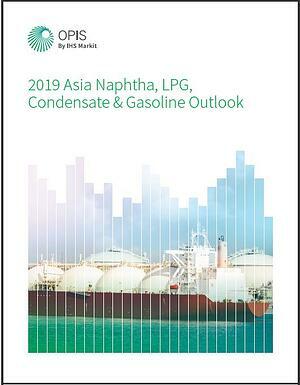 Download your copy of the 2019 Asia Naphtha, LPG, Condensate & Gasoline Outlook. The Asian naphtha market has been falling since early-October 2018, pressured by weaker crude oil and heavy steam cracker turnarounds as well as the record-high volume of arbitrage cargoes from the west. Market focus is now on the naphtha price in the first half of 2019, regarding when the sluggish naphtha market will bottom out, and how much the demand/supply balance will be. There are still uncertainties in the crude oil price and other related markets, such as condensate, LPG and gasoline in the wake of on-going Iranian sanction and the US-China trade dispute. In this special report, OPIS editors on the ground in Singapore provide an outlook and commentary on what Asian naphtha, LPG, condensate and gasoline markets could look like in the first half of 2019. Michelle Chaewon Kim joined OPIS in January 2018 as a Senior Journalist covering Naphtha, LNG and condensate markets. Prior to joining OPIS, she worked for Ernst & Young M&A Advisory as an Energy Strategy Consultant in its Seoul office. She worked for S&P Global Platts based in Singapore as a Senior Market Editor at Petrochemical team, covering aromatics, olefin and polymers. Before joining Platts, Michelle covered financial and business news and market analysis for Korea Economic Daily as a reporter in Seoul. She holds a Master’s degree in International Business from the University of Birmingham, UK, for which she awarded a British Chevening Scholarship from the British Foreign and Commonwealth Office and a Bachelor’s degree in Sociology from Yonsei University in Seoul. She was awarded ‘Young Talented Energy Professional’ at the International Association for Energy Economics (IAEE) annual conference held in Singapore in 2017. Masayuki has been covering Asia’s LPG and condensate markets since he joined OPIS in June 2018. Prior to that, he was a reporter for Reuters for 22 years in Tokyo and Singapore, mainly covering foreign exchange and bond markets, as well as general news. Communication at Yonsei University in Seoul. Follow market trends all year with the Asia Naphtha & LPG Report. It's your single source for naphtha, LPG and gasoline pricing at the major Asia-Pacific hubs. Try it free for 21 days.